And no history, either. 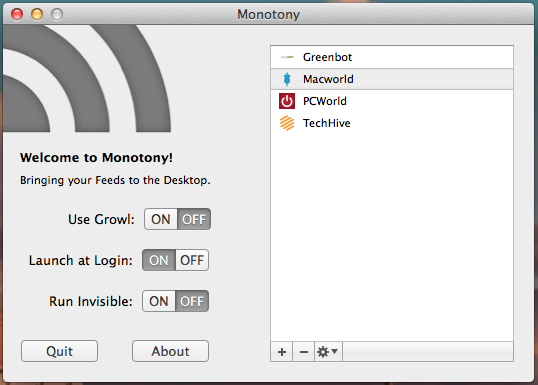 Monotony isn’t the kind of feed reader that you’ll use to catch up on your favorite blogs after cracking open your MacBook each morning, or scroll through days of past posts to find interesting stories. If your Mac is asleep or the app isn’t running, you’ll never see what posted in the meantime without going to the websites in question. The interface consists of a single box accessible from the menu bar, which lets you add RSS and Atom feeds by URL and select options; otherwise it remains out of sight. The stories themselves pop up as Notification Center or Growl alerts, showing the headline, source name, and initial couple of lines of text. Clicking on anything pulls up the full story in your default browser, and that’s really the long and short of this free app. Monotony isn’t so much lacking features as it is intentionally streamlined to appeal to a certain audience—and the average user seeking a sleek repository for flipping through scads of recent posts won’t find much of use here. Similarly, those who don’t keep their MacBooks open all day might struggle with the gaps between stories. If you’re the kind of feed subscriber who simply wants on-the-fly updates while you’re plugged in (with no lingering baggage), then Monotony can provide exactly that.